Immunotherapy of cancer is often performed with altered “analog” peptide Ags optimized for HLA class I binding, resulting in enhanced immunogenicity, but the induced T cell responses require further evaluation. Recently, we demonstrated fine specificity differences and enhanced recognition of naturally presented Ag by T cells after vaccination with natural Melan-A/MART-1 peptide, as compared with analog peptide. In this study, we compared the TCR primary structures of 1489 HLA-A*0201/Melan-A26–35-specific CD8 T cells derived from both cohorts of patients. Although a strong preference for TRAV12-2 segment usage was present in nearly all patients, usage of particular TRAJ gene segments and CDR3α composition differed slightly after vaccination with natural vs analog peptide. Moreover, TCR β-chain repertoires were broader after natural than analog peptide vaccination. In all patients, we observed a marked conservation of the CDR3β amino acid composition with recurrent sequences centered on a glycyl-leucyl/valyl/alanyl-glycyl motif. In contrast to viral-specific TCR repertoires, such “public” motifs were primarily expressed by nondominant T cell clonotypes, which contrasted with “private” CDR3β signatures frequently found in T cell clonotypes that dominated repertoires of individual patients. Interestingly, no differences in functional avidity were observed between public and private T cell clonotypes. 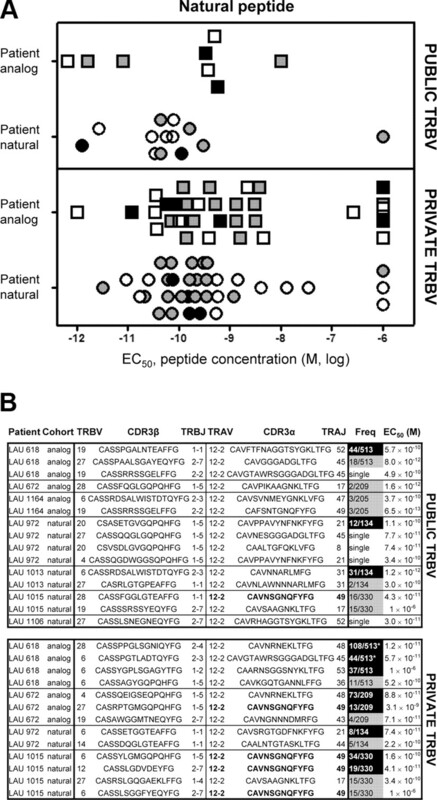 Collectively, our data indicate that T cell repertoires generated against natural or analog Melan-A peptide exhibited slightly distinct but otherwise overlapping and structurally conserved TCR features, suggesting that the differences in binding affinity/avidity of TCRs toward pMHC observed in the two cohorts of patients are caused by subtle structural TCR variations. T cell receptors of mature CD8 T cells recognize antigenic peptides presented by MHC class I molecules, with the result of T cell activation and consequent T cell responses with effector function and immune protection (1, 2). Although the latter is frequently the case in infectious disease, T cell responses against cancer are often insufficient to protect from tumor progression. A central observation is that microbial Ag-specific TCRs are of high affinity, in contrast to lower affinities seen in tumor/self-Ag specific TCRs (3, 4). Affinities/avidities may be even so low that T cells are unable to interact with tumor cells that express and present Ag naturally. Unfortunately, the latter is often observed after immunotherapy (5, 6, 7, 8, 9), presumably because the applied vaccines are not sufficiently optimized to recruit high affinity/avidity T cells. It may well be that low affinity TCRs are unable to protect from disease progression. Because many natural tumor/self Ags bind only weakly and unstably to MHC class I molecules, several tumor Ags have been optimized by modifications that enhance MHC binding while leaving the moieties that interact with the TCR largely unchanged. Such modified tumor Ags are now widely used in clinical immunotherapy trials (10, 11, 12, 13, 14, 15, 16). Accordingly, the immunodominant HLA-A*0201-restricted peptide of the melanoma Ag Melan-A/MART-1 (EAAGIGILTV) was enhanced by an Ala to Leu substitution at position 27 (A27L; ELAGIGILTV) (13). Indeed, this modified analog sequence more readily induced T cell responses than the natural sequence, as confirmed using peptides, DNA, or recombinant viruses for vaccination (10, 11, 12, 13, 14, 15, 16). A potent vaccine formulation composed of low doses of peptides, Incomplete Freund’s Adjuvant (IFA),4 and low doses of CpG oligonucleotides, induced T cell expansion reaching on average more than 1% of specific CD8 T cells in practically all melanoma patients (16). Moreover, it is the first synthetic vaccine formulation that consistently induces ex vivo detectable T cell responses even when using a natural tumor peptide, i.e., the natural Melan-A/MART-1 sequence (17). A direct comparison revealed that vaccination with the analog peptide induced about twice as high T cell frequencies, whereas the T cells induced by the natural peptide were more strongly activated and showed enhanced capacity to recognize low doses and naturally presented wild-type Ag (17). These data confirmed that studies using analog Ags continue to require careful re-evaluation with regard to the risk of activating T cells with imprecise Ag specificity (18). In the present study, we addressed the question whether the observed differences in fine peptide Ag specificity could be explained by structurally different TCRs recruited and promoted by vaccination with natural vs analog Melan-A/MART-1 peptide. We analyzed and compared primary structures of both TCR α- and β-chains of 1489 in vitro generated T cell clones and ex vivo-sorted CD8 T cells. We found subtle variations in TRAJ gene segment usage, CDR3α composition and β-chain diversity, and also show that clonotypes bearing “public” TCR CDR3β motifs were selected at low frequency, but recognized tumor Ag with functional avidity similar to that observed for dominant T cell clones expressing “private” TCRs. Fifteen HLA-A*0201 melanoma patients were recruited after informed consent was obtained in a phase I prospective trial of the Ludwig Institute for Cancer Research (LICR) and the Multidisciplinary Oncology Center (CePO). Study protocols were approved by the medical and ethical committees of the University Hospital (Lausanne, Switzerland). All patients were vaccinated as described before with 100 μg of either the Melan-AMART−126–35 unmodified natural peptide (EAAGIGILTV) or the Melan-AMART−126–35 analog A27L peptide (ELAGIGILTV), mixed with 500 μg CPG 7909/PF-3512676 and emulsified in IFA (17). PBMC were obtained by density centrifugation using Ficoll-Hypaque (Pharmacia Biotec) and cryopreserved in RPMI 1640 supplemented with 40% FCS and 10% DMSO. CD8+ T lymphocytes were positively enriched from cryopreserved PBMCs using anti-CD8-coated magnetic microbeads (Miltenyi Biotech). Cells were stained in PBS, 0.2% BSA, 5 mM EDTA with multimers (1 μg/ml, 45 min, 4°C), and then with mAbs (20 min, 4°C), and sorted into defined populations on a FACSVantage SE, using CellQuest software (BD Biosciences) as previously described (19). Immediate reanalysis of the isolated populations revealed over 95% of purity. PE-labeled HLA-A*0201/A27L Melan-AMART−126–35 peptide multimer was prepared as described previously (20). Allophycocyanin/Cy7-conjugated anti-CD8 mAb and anti-CCR7 mAb were purchased from BD Biosciences, and allophycocyanin-conjugated goat anti-rat IgG was purchased from Caltag Laboratories. PE-Texas Red-conjugated anti-CD45RA was purchased from Beckman Coulter. HLA-A2/multimer+ CD8+ T cells from the effector-memory (EM) subset (21) were cloned by limiting dilution in Terasaki plates, and expanded in RPMI 1640 medium supplemented with 8% human serum, 150 U/ml recombinant human IL-2 (a gift from GlaxoSmithKline), 1 μg/ml PHA (Sodiag), and 1 × 106/ml irradiated allogeneic PBMC (3000 rad) as feeder cells. T cell clones were expanded by periodic (every 3–4 wk) restimulation with PHA, irradiated feeder cells, and human rIL-2. cDNA preparation, 5-cell cDNA amplification, CDR3 spectratyping sequencing, and clonotyping were performed as described in detail elsewhere (19, 22). In brief, 5-cell aliquots were sorted with a FACSVantage SE machine directly into wells of 96 V-bottom plates containing lysis/reverse transcription mix. To rapidly identify TRBV segments usage, a small fraction (5 μl of a total of 50 μl) from 10 individually sorted and amplified 5-cell cDNA samples were pooled and subjected to individual PCR in nonsaturating conditions using a set of previously validated fluorescent-labeled forward primers specific for the 22 TRBV subfamilies and one unlabeled reverse primer specific for the corresponding C gene segment (23). This TRBV-CDR3 spectratyping analysis based on the equivalent of 50 cells represents a prescreening step that allows saving time and reagents (data not shown). Once positive TRBV subfamilies were identified, the following step consisted in subjecting each individually generated five-cell cDNA sample and in parallel in vitro generated T cell clone (from ca. 10,000 cells) cDNA sample to TRBV and TRAV12-2 specific PCRs. Separation and detection of amplified fragments that contain the entire CDR3 segment was performed in the presence of fluorescent size markers on an ABI PRISM 310 Genetic Analyzer (Applied Biosystems) according to the manufacturer’s recommendations and data were analyzed with GeneScan 3.7.1 (AppliedBiosystems). In the last step, PCR products of interest were directly purified and sequenced from the reverse primer (Fasteris). Clonotypic primers for several CDR3 sequences were validated and used in clonotypic PCR for determination of clonotype frequencies. All ex vivo five-cell or in vitro T cell clone cDNA samples, isolated from patients vaccinated either with ELA or EAA peptide, were processed with the same rigorous approach to allow direct comparison between both cohorts of patients. Our previous studies have revealed similar results when TCR repertoires were determined with the five-cell approach as opposed to the strategy with T cell clones generated in vitro (19, 24). Nevertheless, we cannot entirely exclude some bias, e.g., because some T cell clones may have been less likely to survive and expand in long-term cultures than others. TCR sequences were described according to the numbering and nomenclature rules of the ImMunoGeneTics (IMGT) Scientific chart (http://imgt.org/) (25). When indicated, the Arden nomenclature was also used for easier comparison to older studies (26). CDR3 sequences were aligned with the Kalign Multiple Sequence Alignment algorithm (http://www.ebi.ac.uk/Tools/kalign/) (27), including high gap open penalty and no terminal gaps, from Cys104 to Gly119. Alignment files were manually refined to exclude unnecessary gaps, in particular at the end of the CDR3 among the TRBJ segment-encoded residues. Patterns in the alignment were then represented graphically with WebLogo 3 (http://weblogo.threeplusone.com/) as sequence logos consisting of stacks of symbols representing every amino acid for each position in the consensus sequence. In brief, the overall height of each stack shows the degree of conservation, the height of each of symbol within the stack indicates the absolute (bits) or relative (probability) frequency of each residue, and the width of the stack is proportional to the fraction of valid symbols at that position (28). The IMGT Junction Analysis tool (http://www.imgt.org/IMGT_jcta/jcta?livret=0/) was used to delineate the genes and N-diversity resulting in the V-D-J junction (29). Term of “dominant clonotype” refers to a nucleotide sequence found at least twice in a given patient. A public TRBV sequence defines the amino acid sequence of a given TRBV-CDR3β-TRBJ found in at least two different patients. Similarly, a public TRAV implies that the same TRAV-CDR3α-TRAJ amino acid sequence is found within at least two patients. Lytic activity and Ag recognition was assessed functionally in 4-h 51Cr-release assays using T2 target cells (HLA-A*0201pos/Melan-A−) pulsed with serial dilutions of natural Melan-AMART−126–35 peptide (EAAGIGILTV) or of the analog Melan-AMART−126–35 A27L (ELAGIGILTV) (30). The percentage of specific lysis was calculated as 100 × (experimental − spontaneous release)/(total − spontaneous release). Previous studies have pointed out the preferential usage of TRAV12-2 in HLA-A2/Melan-A-specific T cells, from both TIL and PBL stimulated with analog Melan-A decapeptide from melanoma patients (31), and from healthy donor cord blood cells and thymocytes (32), as well as after vaccination with the analog peptide (19). Here we report the extensive molecular analysis of CD8+ T cell responses directed against the Melan-A Ag from two cohorts of HLA-A2 patients vaccinated with either the natural Melan-AMART−126–35 unmodified decapeptide or the mutated Melan-AMART−1 A27L modified heteroclitic peptide, and CpG combined with IFA (17). The goal of this comparative study was to discriminate elements from the TRAV and/or TRBV repertoires that could account for the differential functional avidity observed in these two cohorts of patients in a homogenized and quantitative manner. First, we sorted effector-memory Melan-A-specific CD8+ T cells (CD45RA−CCR7−) from four patients of each cohort and generated 1489 T cell clones. The TRAV repertoire was analyzed using TRAV12-2/TRAC PCR. According to previous studies, the majority of multimer+ T cells from patients vaccinated with the analog peptide expressed TRAV12-2, with a median of 70.3% of the cells (Fig. 1⇓A). Importantly, similar TRAV12-2 restriction was also observed for T cells after natural peptide vaccination, with a median of 84.6% of positive clones (Fig. 1⇓A). Of note, this difference was explained by the presence of one outlier patient in the analog peptide cohort from which only 38.8% of the clones displayed the TRAV12-2 segment. Interestingly, T cells from this patient depicted a particular cellular response in which no cytokines were released when stimulated with the antigenic peptide (data not shown). Beside the TRAV12-2 gene dominance, we found that 20 of the 32 tested TRAV gene segments (33) were also selected in the TRAV12-2-negative population, with a slight preference for TRAV17, TRAV25, and TRAV35, which appeared each in four different patients (data not shown). Nevertheless, the data underline the clear TRAV12-2 restriction in specific T cells induced by vaccination with the unmodified peptide, in the same manner as in CD8 responses induced with the modified analog peptide, reinforcing the stringency of the latter vaccination protocol. Moreover, the very recent crystal structure of the Melan-A-MHC-TCR complex shows that the TRAV12-2 gene product is essential for specific recognition of the Melan-A analog peptide bound to HLA-A*0201 (34). In particular, its CDR1α loop interacts largely with the antigenic peptide, constituting a “innate” binding pattern for this Ag. Therefore, the fine peptide specificity toward the analog and the natural Ag could be conferred by the CDR3 loop of the α-chain and/or the TRBV domain. In-depth analysis of the structural characteristics that define TRAV chain specificity for a Melan-A peptide in vaccinated melanoma patients. A, Melan-A-specific CD8+ T cell clones (1489 clones) were generated from four melanoma patients vaccinated with the unmodified (defined as “natural”, gray box) peptide and four melanoma patients vaccinated with the A27L-modified (defined as “analog”, full box) peptide, and their cDNA were tested individually in TRAV12-2/TRAC PCR. Vertical boxes represent the frequency of TRAV12-2-positive clones among all patients in each cohort, with the upper limit the highest percentage, the lower limit the lowest percentage, and the line indicates the median percentage. B, All PCR products obtained in A were analyzed by capillary gel electrophoresis (CDR3 spectratyping), and products of interest (i.e., dominant clonotypes) were sequenced. The curves correspond to the distribution of the TRAV CDR3 lengths (according to the IMGT definition) among 159 individual sequences (80 sequences from the natural cohort, represented by the gray line, and 79 from the analog cohort, represented by the black line). C, The bars quantify the indicated TRAJ segment usage as analyzed from sequences resolved in B. Gray and full bars represent sequences from the natural and the analog cohorts respectively. D, Sequence logo representations of the amino acids that determine the TRAV-CDR3 junction in the two cohorts of sequences (upper panel, natural, lower panel, analog). The first five residues from Cys104 of all sequences in each cohort were aligned without gap, and their relative frequency is represented proportional to the height of the corresponding symbol in the stacks. We next fully assessed the primary structure of these TRAV12-2 domains by CDR3 spectratyping and sequencing and obtained 159 different single sequences, which accounted for 60% of the total Melan-A TRAV12-2 repertoire from the two cohorts of patients. We analyzed the CDR3 length distribution in the two cohorts and observed that analog TRAV12-2 CDR3 were highly restricted to a length centered on 10 amino acids whereas clonotypes from the natural cohort showed a more heterogeneous distribution with two main peaks of equivalent areas, one centered on 9 and the second centered on 12 residues (Fig. 1⇑B). Because D gene segments are absent in the TCR-α V domain, TRAV CDR3 is mainly encoded by TRAV/TRAJ segment recombination and some nongermline N-nucleotide additions, suggesting that TCR CDR3α specificity is mostly determined by the TRAJ usage. In this study, we show that, although the TRAJs were largely heterogeneous, with 41 of the 63 TRAJ human genes used by Melan-A-specific TRAV12-2 clonotypes, these TCRs consisted predominantly of the gene segments TRAJ31, 39, 43, 45, and 49, which represented 41% of the TRAV12-2 repertoire in the two cohorts of patients (Fig. 1⇑C). We noticed a relatively heterogeneous TRAJ usage at all CDR3 lengths, with the exception of the CDR3 of 10 amino acid length in which TRAJ45 represented ∼45% of the sequences in the analog cohort, and TRAJ39 represented ∼50% of the sequences in the natural repertoire (data not shown). This trend was particularly evident when considering dominant clonotypes, i.e., identical TCR sequences occurring in more than one clone, and thus representing the expansion of particular clones selected by the Ag (24). Indeed, preferential usage of TRAJ45 was found in several dominant clonotypes exclusively in the analog cohort, whereas TRAJ39 was entirely found in dominant clonotypes from the natural cohort (data not shown). The widely used TRAJ31 segment was mostly but not exclusively found in TRAV12-2 of the natural repertoire (Fig. 1⇑C), and formed CDR3 of various lengths (data not shown). Of note, the natural TRAJ repertoire was more heterogeneous with 36 different TRAJ segments, that contrasted to the analog repertoire, which used 28 different TRAJ segments, and these two repertoires were not necessarily overlapping (Fig. 1⇑C). Collectively, despite the high heterogeneous TRAJ usage found in the two cohorts of patients, there are clear biases and differences between the two repertoires, as reflected by variations in CDR3 lengths, which may explain the specificity toward the antigenic peptide. Finally, we aligned all CDR3 sequences of each cohort and investigated specifically the TRAV/TRAJ junction, which defines TRAV diversity. The three first residues from Cys104 were highly conserved in the two cohorts of patients, with a majority of TRAV sequences (∼75%) expressing a cysteyl-alanyl-valyl motif at this junction (Fig. 1⇑D and supplemental Fig. S1).5 These residues are encoded by the TRAV12-2 gene segment and were not deleted during TCR rearrangement. The following two residues were found to be more heterogeneous, although the fourth amino acid was mostly an asparagine (between 25 and 30% of the sequences), a residue that is still encoded by the TRAV12-2 gene, and to a lesser extent a serine or a glycine (Fig. 1⇑D). Together, these three amino acids accounted for ∼65% of the residues found at the fourth position. Interestingly, some differences appeared at the fifth position of this hypervariable site, whereby asparagine was found in 20% of the sequences from the natural repertoire, and glycine in 30% of the sequences of the analog repertoire (Fig. 1⇑D). Importantly, these residues were mostly encoded by their respective TRAJ segment usage (Fig. 1⇑C). Beside asparagine and glycine residues, the remaining ones occupying this CDR3 position were highly diverse. Altogether, these observations suggest that, despite a restricted and common TRAV12-2 usage, heterogeneous but differential TRAJ usage in T cell clonotypes of the two cohorts could confer the specificity of the TRAV CDR3 for the natural or the modified Melan-A peptide, particularly at position 5 within the CDR3α. At present, we cannot yet explain these relative high CDR3 diversities. It seems evident that the TRAV12-2 chain is essential for proper and specific recognition of the Melan-A peptide in the context of HLA-A2, and trends in the TRAJ usage, reflected at least at the CDR3 junction site, could explain the fine specificity of recognition toward variations in the Ag (native vs analog peptide). We next investigated quantitatively the TRBV repertoire used in these Melan-A-specific T cell clones from the two cohorts of patients by first testing individually all the cDNA previously prepared in PCR with pairs of primers designed for the amplification of all known TRBV gene segments (23). Recently, Serana and colleagues (35) have compiled 210 TRBV single sequences from the literature and pointed out, beside a high heterogeneity in the TCRβ repertoire, the preferential usage of TRBV4, 6, 20, 27, and 28, and of TRBJ1-5, 2-1, and 2-7 in HLA-A2/Melan-A-restricted CD8 T cells from melanoma patients. In this study, we show that TRBV4, 6, 19, 27, and 28 segments were the most representative of the Melan-A-specific responses induced in all eight patients, and altogether were used by a median of 61.8 and 75.9% of the clones in the natural and analog cohorts respectively (Fig. 2⇓A). Interestingly, no significant differences in the TRBV usage appeared between the two cohorts, within the limitation of interindividual variations, but with the exception of TRBV19, which was used at a median frequency of 6.6% in the natural cohort and 12.9% in the analog cohort. However, the cumulative proportion of TRBV usage others than TRBV4, 6, 19, 27, and 28 was relatively higher in the natural cohort, with a median of 38.2% when compared with the analog cohort (with a median of 24.1%). Complete characterization of the TRBV repertoire and TRBJ usage of Melan-A-specific CD8+ T cells detected in vaccinated melanoma patients. A, As in Fig. 1, the same cDNA samples prepared from CD8+ Melan-A-specific clones generated from the eight patients were tested individually by PCR for the presence of one of the 22 TRBV segments. Vertical boxes represent the frequency of TRBV4, 6, 19, 27, or 28-positive clones and clones positive for other TRBV among all patients in each cohort, with the upper limit the highest percentage, the lower limit the lowest percentage, and the bar indicates the median percentage. 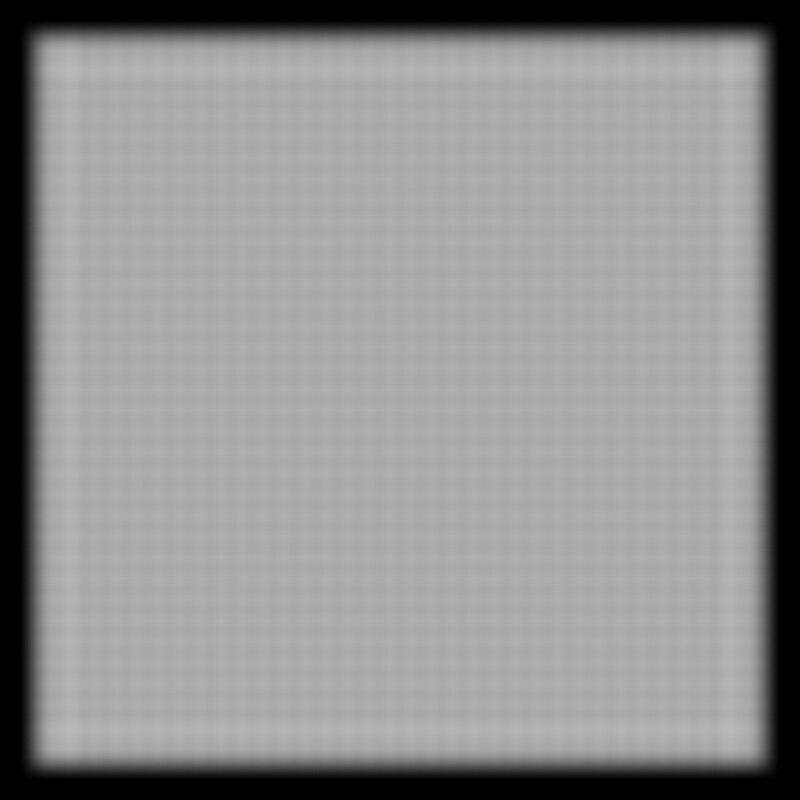 Gray and full boxes represent proportions of clones generated from the natural and the analog cohorts respectively. B, All PCR products obtained in A, as well as products amplified from ex vivo 5-cell samples were analyzed by capillary gel electrophoresis (CDR3 spectratyping). Five patients from the natural cohort () and ten from the analog cohort (▪) were used in this part of the study. Products of interest (i.e., low dominant and high dominant clonotypes) were sequenced. Chart depicts the distribution of TRBV usage from 696 single sequences (235 and 461 sequences from the natural and the analog cohort, respectively). Height of each bar represents the relative distribution (in rounded percentage) of clonotypes of both cohorts that express a given TRBV as determined from the 696 sequences. Numbers inside the bars correspond to the rounded frequencies for a given TRBV usage found for each individual cohort (natural, 235 sequences; analog, 461 sequences). The TRBV Arden nomenclature is indicated for information in brackets in A and B. Frequencies <1% are indicated by ∗. C, The bars quantify the indicated TRAJ segment usage as analyzed from sequences resolved in B. Gray and full bars represent the relative distribution of sequences from the natural and the analog cohorts, respectively. We also assessed 696 single TRBV chain sequences representative of 15 patients, five from the natural cohort and ten from the analog cohort. Indeed, to get a larger view of the Melan-A response, we did not only use T cell clones generated in vitro but also Melan-A-specific CD8+ T cells from directly sorted ex vivo 5-cell samples (22). We confirmed the preferential usage of TRBV4, 6, 19, 27, and 28, in addition to TRBV5-1, 7, and 20 (Fig. 2⇑B). The repartition of these TCR β-chain usages was again equivalent between the two cohorts of sequences, apart of TRBV19. Importantly, T cell clonotypes from the natural cohort presented a striking propensity to express more frequently TRBV5-1 and 20, and exclusively TRBV9, 12, and 14 subfamilies. This was even more evident when we focused our analysis on the dominant expanded clonotypes for which those particular TRBV accounted for 20.8% of the repertoire, and were significantly more represented in the natural cohort of vaccinated patients (data not shown). This suggests that although the TRBV repertoires selected during both protocols of vaccination are fully overlapping, the Melan-A-specific CD8+ T cell response induced by vaccination with the natural peptide is less restricted and thus more permissive to the expansion of clonotypes that bear additional and more heterogeneous TCR β-chains. Finally, we confirmed the prevalence of the TRBJ1-5 and TRBJ2-7 segments, as well as the frequent usage of TRBJ1-1, 1-2, 2-1, and 2-2, distributed equivalently within the two cohorts of patients, which all together formed 80.3% of the TCRβ repertoire (Fig. 2⇑C). In the same manner as described for TRAJs, subtle variations in the range of TRBV usage by the two cohorts of sequences may account for the differences in the selectivity toward one or the other peptide during vaccination. Because peptide contact is made primarily through the CDR3β loops, which exhibit the greatest degree of genetic variability, we next analyzed the complete CDR3β domain sequences. The two cohorts of clonotypes showed a comparable distribution of their CDR3β lengths, centered on 12–13 amino acids, varying from 10 to 18 (data not shown). We aligned the previously retrieved 696 TRBV sequences from the natural and the analog cohorts with the Kalign algorithm. This is a different approach than the IMGT alignment, which gives more functional information because it mostly depends on the CDR3 amino acid composition and not only on its CDR3 length. A raw alignment of all clonotypes already gave an interesting profile in which a central leucyl, and to a lesser extent alanyl and valyl, was frequently present (supplemental Fig. S2 and S3). We added structure constraints within the alignment file, namely removal of all gaps before Ser106 (CAS), delimiting the end of the β sheet closest to the CDR3, as well as gaps after residue 118 (TRBJ), which marks the beginning of the β sheet immediately downstream the CDR3, as determined on the three-dimensional structure of the TCRβ-chain in the HLA-A*0201/Tax peptide-TCR (TRAV12-2-TRAJ24/TRBV6-TRBJ2-7) complex crystal (36). Thus, only loops within these two fixed blocks of residues were aligned according to their physicochemical properties. A Logo representation of the alignments for the two cohorts of clonotypes gave a similar consensus sequence, with conserved residues at both ends due to structural constraints and seven to eight position gaps reflecting variations in CDR3 lengths and best positioning of the loops during the alignment process. Moreover, apart from a real heterogeneity in the CDR3β sequences as shown by the absence of central blocks with heights higher than 1.6 bits on the 5.2 bits total, a glycyl-leucyl-glycyl motif could be drawn (Fig. 3⇓A). Analysis of the TRBV CDR3 characteristics of CD8 responses induced by peptide vaccination in melanoma patients. A, TRBV logo representation generated from the alignment of 235 sequences of the natural cohort (upper panel) and of 461 sequences of the analog cohort (lower panel) with the Kalign algorithm. Amino acids are colored according to their chemical properties (polar in green, basic in blue, acidic in red, and hydrophobic in black). Insets are enlarged logos of the central motif from position 10 to 12 represented in a relative scale. B, Nucleotide sequences of the public TRBV CDR3 (spanning residues Cys104 to Gly119) detected in seven of fourteen patients tested. Contributions of each V, D, and J segment genes as well as N-nucleotide additions were determined by the IMGT Junction Analysis tool and are indicated on the top. Patient code, peptide used for the vaccination, as well as TRBV and TRBJ usage are shown. Corresponding amino acid sequence is indicated on the bottom. The “GLG” motif has been recently described as a public sequence (35). Analysis of the amino acids contributing to this central motif showed subtle differences in the CDR3 from the natural and the analog cohort of vaccinated patients (Fig. 3⇑A, see insets). Although glycine, serine, and threonine residues account for >60% at position 10, and glycine, alanine, serine, and asparagine for >70% at position 12, the analog cohort has a tendency to use leucine (60%) at position 11 more frequently than the natural repertoire. In fact, in the latter repertoire, leucine, alanine, and valine, all hydrophobic amino acids, can be used in, respectively, 40, 20, and 10%. Despite few exceptions, such public CDR3β motifs were mostly encoded by the same TRBV-TRBJ, and did not necessarily bear a common TRAV chain (data not shown). For instance, we detected a highly conserved CDR3β CAS-SFQGLGQPQ-HFG amino acid sequence in 7 of 14 tested patients (Fig. 3⇑B). Strikingly, the “GLG” motif was mainly encoded by nongermline segments, with more or less amino acid deletions in the diversity region that can carry a point mutation, and with codon usage that varied in the N regions. Thus, as a consequence of the random TCR V-D-J rearrangement process, most of the GLG codons were formed by a portion of TRBD, N-nucleotide addition/deletion and to some extent by a portion of TRBJ. These results clearly show that the central motif GXG (in particular GLG) obtained after alignment of our clonotype sequences represents a public motif in Melan-A-specific T cell responses that is found in both cohorts of patients. In this study, we identified at least 23 public TRBV sequences that represented 57 T cell clonotypes isolated from 15 melanoma patients. These public sequences were equivalently distributed within the two cohorts of vaccinated patients (Fig. 4⇓A). A striking finding was the presence of clonotypes bearing the “GLG” motif, very similarly to the public sequence described above (Fig. 3⇑B), in which variations were found in the TRBV and/or TRBJ usages and/or different recombination features (Fig. 4⇓A, data not shown), thus reinforcing the importance of this particular motif. Importantly, because our study allowed the precise quantification of the presence of the “GLG” motif, it appeared as a relatively nondominant motif, because sequences containing this particular motif were only detected in 15.3% of the 696 TRBV sequences (including nondominant and dominant-expanded T cell clones) from the natural cohort and in 18.7% of the clonotypes from the analog cohort (supplemental Fig. S2 and S3). Yet, it is important to mention that these frequencies do not take into account the relative proportion of each clonotype within the Melan-A specific T cell response. Indeed, we recently showed (19, 24, 37) that tumor Ag-specific T cells are composed of clonotypes that can be preferentially selected and amplified (defined as dominant expanded T cell clones) as well as of clonotypes of lower frequencies (defined as low dominant clones). Therefore, we also characterized the distribution of the 57 public T cell clonotypes according to their relative frequency among the Melan-A specific population (Fig. 4⇓B). Analysis of the relative frequencies of public T cell clonotypes within Melan-A specific T cells. A, Compilation of the 23 public amino acid TCR β-domain sequences, spanning residues Cys104 to Gly119, detected in 15 patients from the indicated cohort, either from ex vivo five-cell samples or from in vitro generated T cell clones. TRBV and TRBJ segment usage are indicated for all sequences. Their relative frequencies are indicated on the right side of the table. Single clonotypes are represented in white, low dominant (i.e., 1–5% of the five-cell samples or clones) are in gray, and high dominant (with frequency >5%) are in black. The GLG motif is underlined, and motifs similar to GLG are in italics. ∗, Independent experiment. B, Graph summarizes the distribution of these clonotypes according to their relative frequency. Same color codes as in A are used. Interestingly, the majority of these TRBV public sequences were largely present as single clonotype sequences in individual patients (54%, Fig. 4⇑B), but they were recurrent as they are found within various patients. Moreover, about a third (35%) of the Melan-A specific clonotypes that bear a public TCR sequence were found at low frequencies (between 1 and 5%). Finally, only six “public” clonotypes of 57 were typically found at higher frequencies (>5%), indicating specific clonotype selection and expansion within particular patients. Such T cell clones represent highly dominant clonotypes. For instance, this was the case for patient LAU 444, in whom we identified a single naturally primed T cell clonotype that dominated the CD8 T cell response to the Melan-A Ag (19). Yet, the same TCR β-chain sequence was found once as a single sequence among the Melan-A specific T cells from patient LAU 818 (Fig. 4⇑A). Collectively, our data reveal that public T cell clonotypes are rather infrequent within Melan-A-specific T cell responses of both cohorts of patients. In contrast, the dominant Melan-A specific T cell clonotypes of high frequency that expand during peptide vaccination are highly specific to individual patients as defined by their private CDR3β motifs. We next evaluated the Ag specificity and the lytic capacity of 21 HLA-A*0201/Melan-A-specific T cell clones expressing public TCRs in cytotoxicity assay. As shown in Fig. 5⇓A, we did not observe any drastic differences in functional avidity between public and private clonotypes, as both groups efficiently killed T2 target cells loaded with the natural Ag as well as tumor cells that naturally express and present the Ag (data not shown). The range of EC50 values (peptide concentrations at half maximal lysis) was similar when we compared each group of clonotypes (single, low dominant and high dominant), and thus was independent of their frequency. The observation that half of the clonotypes showed low functional avidity (>1 × 10−6 M) while the other half bear TCRs of higher avidity (<1 × 10−9 M) most likely reflects the presence of T cells at different stages of differentiation (EM28− and EM28+), thus showing varying lytic capacities (38). Interestingly, public clonotypes present the same fine Ag specificity differences as private ones. Vaccination with the natural peptide selected both “public” and “private” T cells (Fig. 5⇓A), with higher functional avidities against the natural peptide than vaccination with the analog peptide (17). Similar results were found when public and private T cell clonotypes from both cohorts of patients were tested against the modified peptide (data not shown). Analysis of the in vitro relative cytolytic activity of public vs private T cell clonotypes. A, Cytolytic assays were performed with chromium labeled T2 target cells loaded with different concentrations of peptide and clones expressing a public (upper panel; n = 21) or a private (lower panel; n = 74) TCR β-chain. Clones generated from patients vaccinated either with the analog (squares) or the natural (circles) peptide were tested in cytolysis assays using the natural Melan-A peptide. Full peptide titrations were performed for all combinations. Each data point represents an individual clone and the peptide concentration required for half maximal lysis (log EC50), and is colored respectively to the frequency of the corresponding clonotype in the EM population (single clonotypes are represented by opened symbols, low dominant are in gray, and high dominant, i.e., with frequency >5%, are represented by filled symbols). When clones of a same clonotype (defined as “sister clones”) gave significantly different values, two data points corresponding to extreme EC50 values are shown. Data points at the EC50 value of 1 × 10−6 M correspond to clones that have low (i.e., with percentage of maximum lysis <25%) or no killing activity, and from which EC50 values could not be accurately calculated. B, Collection of 15 public (upper panel) and 13 private (lower panel) T cell clones, as shown in A, from which the full αβTCR was sequenced. Additional clones (three from the public group and seven from the private group) were identified as TRAV12-2-negative (data not shown). For each clone tested, patient code and its cohort, TRBV, amino acid sequence of the CDR3β, TRBJ, as well as TRAV, amino acid sequence of the CDR3α, TRAJ, frequency of the TRBV (same color code as in Fig. 4), and the corresponding EC50 value are indicated. The public TRAV clonotype “TRAV12-2-CAVNSGNQFYFG-TRAJ49” is depicted in bold. ∗, Experiments whereby one or more clones sharing identical αβTCR (sister clones) displayed a low lytic activity, thus we indicated the representative EC50 (data not shown). We also assessed the complete αβTCR primary structure of a selection of 38 T cell clones defined as either public or private based on their TRBV sequences (Fig. 5⇑B). 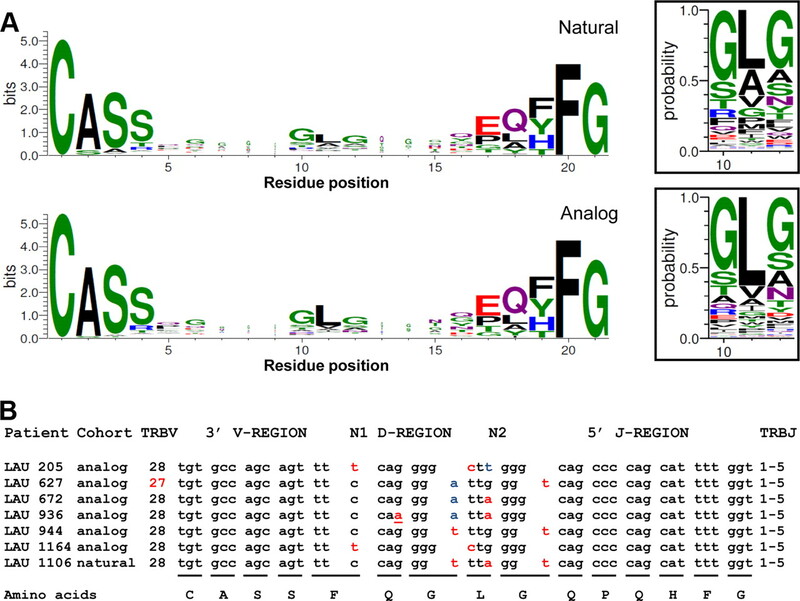 No particular sequence signature emerged when the different TRBV/TRAV combinations were compared with their respective functional avidities of Melan-A Ag recognition, neither did we find a correlation between the relative frequencies of particular clones and their relative cytolytic activities. T cell clones bearing distinct primary TRBV/TRAV structures covered the full range of functional avidity of Ag recognition (from 10−6 to ∼10 −12 M). Clearly, three αβTCRs pairs were less optimal as they were associated with poor peptide recognition (EC50 10−6 M, patients LAU 1015 and LAU 618). Similarly to the described panel of TRBV sequences, we found in this study nine TRAV12-2 sequences that could be defined as public TRAVs (supplemental Fig. S1). Intriguingly, the functional avidity of the public TRAV clonotype “TRAV12-2-CAVNSGNQFYFG-TRAJ49” was highly dependent on its complementary TCR β-chain, because EC50 were widely ranging from 10−6 to 4.6 × 10 −11 M (Fig. 5⇑B; patients LAU 1015 and LAU 672). 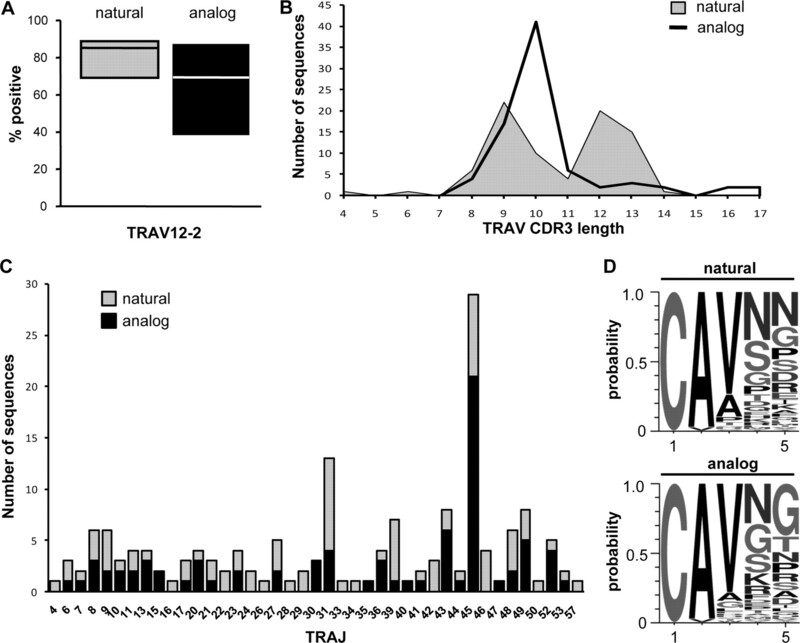 Moreover, no apparent elements of the primary structure could be identified within the nine public TRAV12-2 that could be associated with either their selection at high frequency or increased TCR avidity (supplemental Fig. S1). Conversely, we observed that association of various TRAV chains to a given public TRBV sequence in different patients, also led to drastic variations in their functional avidity (data not shown). Finally, TRAV12-2 restriction is not a prerequisite for the exclusive recognition of the Melan-A Ag in the context of HLA-A*0201. Indeed, 10 additional T cell clones that were defined as TRAV12-2-negative achieved similar lysis (EC50 ranging between 10−6 to 10 −12 M; data not shown). Overall, our data suggest that the selection of high affinity αβTCRs against the Melan-A Ag is not fully dictated by TRBV and/or TRAV motif sequences. The impact of TCR diversity on recognition of single antigenic pMHC complexes has been extensively investigated, and the relative contribution of each TCR chain have been addressed in several models. In particular, strong biases in the TCR repertoire selection of Ag-specific T cells, resulting in the preferential usage of particular αβ TCR combinations have been reported. The human CTL response to influenza A matrix in individuals with HLA-A*0201 is characterized by prominent usage of the TCR TRAV27/TRBV19 containing a conserved arginine-serine-serine sequence within the CDR3β regions (39, 40). Another example involves the T cell response to the EBNA3 Ag of EBV seen in HLA-B8-positive individuals whereby nearly all specific CD8+ T cells use TCR TRAV26-2/TRBV7-8 and share conserved CDR3 sequences (41). Recently, we reported that similar to the T cell responses against immunodominant viral Ags, CD8+ T cells specific for the cancer testis Ag NY-ESO-1157–165 exhibited biased TCR repertoires (37), with the preferential usage of three distinct sets of αβ TCRs (TRAVx/TRBV9, TRAV17/TRBV12-3, and TRAVx/TRBV6). In the present work, we strengthen these observations and quantify the preferential usage of TRAV12-2 and a small number of TRBVs in the immune response specific for the Melan-A/MART-1 Ag. Moreover, it is the first comprehensive comparison of the clonotype composition of CD8 T cell responses to vaccination with either the natural or the heteroclitic Melan-A analog peptide, which became possible with the use of CpG during vaccination (17). The two cohorts of vaccinated patients shared very similar αβ TCR repertoires, as demonstrated by the strong restriction for TRAV12-2, the preferential usage of particular TRBV and TRBJ gene segments, and the high degree of sequence conservation throughout both CDR3α and β domains. These TRAV-TRBV biases are specific to the Melan-A Ag, because such repertoire distribution was not observed in the T cell responses induced in other well-described tumor and viral systems (37, 39, 40, 41, 42). Similarly, the dominant usage of the TRBJ1-5 (by 19.6% of all sequences) is also a characteristic signature of the Melan-A response (35). Finally, we describe for the first time that the TRBV repertoire after vaccination with the natural peptide is more diverse but yet overlaps the repertoire selected by vaccination with the analog peptide. Importantly, despite the still relative heterogeneity in TRBV usage, there are some conserved features among the primary structures of TRBV6, 19, 27, and 28, four of the five preferred TRBV chains, as they share between 50 to 74% of identity (26). The recent crystal structure of the Melan-A-MHC-TCR (TRAV12-2/TRBV30) complex (34) brought important insights into the key elements within the TRAV and TRBV gene segments that are involved in the recognition of the Melan-A Ag. Indeed, Cole and colleagues (34) showed that only CDR1α, CDR3α, and CDR3β loops make contacts with the Ag, and in particular that Gln31 in CDR1α is involved in several electrostatic and van der Waals interactions with four residues of the Melan-A peptide (Glu26, Leu27, Gly29, and Ile30). Importantly, Asn92 is the only residue from the CDR3α that interacts with the Ag. In line with these data, we show in this study that this residue is commonly expressed by TRAV12-2-positive T cell clonotypes of both cohorts of vaccinated patients (Fig. 1⇑D). Nevertheless, we identified additional components in the CDR3α region associated with variations in TRAJ usage that could account for the fine specificity for the peptide. Indeed, our data points toward clear biases but differential TRAJ usage between the two repertoires of the melanoma patients, as shown by variations in the CDR3α length distribution. Moreover, the CDR3α junctional site and particularly the fifth position within the CDR3α may explain the fine specificity conferred by the TRAV chain for the natural or the modified Melan-A Ag. The crystallized Melan-A-MHC-TCR complex structure also indicates that residues Thr96, Leu98, and Gly99 in the CDR3β loop, which are part of the public CDR3β motif that we describe in this study, interact strongly with residues Ala28, Gly29, Ile30, Gly31, Ile32, and Thr34 of the peptide (34). Another study showed that both natural and analog peptides adopt a “bulged” conformation when bound to the HLA-A2 molecule, and that only the side chain of Leu33 of the Melan-A peptide shows consistent conformational heterogeneity (43), suggesting that the specificity of the TCR for the peptide may reside at this position. Yet, the precise role of the CDR3β consensus structural motif, the similarity of the preferential TRBV chains used in Melan-A-specific CD8 responses, and the implication of other TRAV and TRBV residues in binding to the MHC or to the peptide/MHC need to be further addressed. Moreover, it will be of great interest to identify general features among the TCR repertoires selected by the two cohorts of patients based on the recent Melan-A-MHC-TCR crystal (34), and to determine which elements may dictate the TCR specificity toward natural or analog peptide. Particular characteristics of the TRAV12-2-negative α-chains that are expressed by a relative significant proportion of Melan-A-specific T cells in melanoma patients should also be investigated. Another important question concerns the frequency and the functional properties of public vs private clonotypes, and the bona fide clinical benefit obtained after their in vivo expansion. Price and colleagues (44) recently described the protective activity mediated by public Gag-specific TRBV clonotypes in vaccine-induced SIV-specific CD8+ T cell responses, by taking into account the need to preserve some degree of cross-reactivity toward epitope variants to contain viral escape. Similar studies may be performed for TCRs specific for viral epitopes that do not mutate, as in the case of EBV and CMV, which are also known to elicit public TRBV sequences (45, 46). In the present study, we asked whether such “public” T cell responses could be induced during Melan-A vaccination by changing the vaccine formulation (e.g., nature of the Ag, costimulatory molecules, and cytokines). Our results show that the Melan-A specific response was at least composed of 23 different public TRBVs, which were found across all studied patients (n = 15). Several public TRAVs were as well identified, yet no full public TRBV/TRAV combinations could be documented in this study. Clearly, common TCRβ motifs have been selected after vaccination in different patients, but at lower frequency compared with distinct and individual-specific private TCR structures. Both public and private TCRs recognized tumor cells with comparable avidities suggesting that neither had a clear advantage. Importantly, identification and quantification of these “public” and “private” dominant anti-tumor selected T cell clonotypes is a key step to better understand the functional requirements of TCRs to efficiently recognize tumor cells. Therefore, future direction involves the subsequent fine characterization at the single cell level of these repertoires and their implication during disease as well as following therapeutic vaccination. Finally, there is a clear need to further investigate the structural, biophysical and functional impact of both public and private T cell clonotypes in the process of recognition of the pMHC complex. This strategy has been recently applied in the context of T cell responses associated with HCMV reactivation (47) where Gras et al. (48, 49) showed that the public RA14 TCR directed against pp65/HLA-A2 displayed a high structural complementarity with the entire peptide, that contrasted with previous studies. Peptide-based cancer vaccines are often prepared with altered “analog” or “heteroclitic” Ags that have been optimized for HLA class I binding to enhance their immunogenicity (10, 11, 12, 13, 14, 15, 16). Therefore, it is important that structural modifications of peptides only minimally alter TCRαβ repertoires and TCR binding properties to ensure that vaccination induced T cell clonotypes are still specific for the natural Ag and efficiently recognize tumor cells. In this study, we demonstrate that vaccination with either natural or altered peptide induced only subtle structural variations within the TCRαβ repertoires against the Melan-A epitope. This became particularly evident when we focused our analysis on the public TRBV chains, whereby identical TRBV sequences were found across the two cohorts of melanoma patients, irrespectively of whether they received the analog or the natural peptide. Moreover, our data further confirm that T cells elicited by both Melan-A peptides are highly cross-reactive as they do not only exhibit overlapping TCR repertoires but have also potent antitumor cytolytic activity. However, as recently shown (17), vaccination with the natural peptide induced T cell responses with superior tumor reactivity compared with T cells from patients vaccinated with the analog Melan-A peptide (Fig. 5⇑). One possible explanation is that vaccination with natural peptide may recruit T cells of superior TCR affinity, and further work should include binding analysis to pMHC by different TCRs isolated from the two cohorts of patients. The clinical relevance of different TCRs in terms of tumor cell elimination needs to be assessed in large phase III clinical studies with thousands of patients. Nevertheless, preclinical testing and small scale phase I/II clinical studies remain highly useful. Because high TCR avidity is one of the most important correlates of protection (3, 4, 50, 51, 52), it is certainly justified to optimize and assess novel vaccine formulations and protocols in such settings, allowing to select the most promising approaches for large scale phase III trials. We gratefully acknowledge all our melanoma patients for active participation in this study, and Pfizer and Coley Pharmaceutical Group for providing CPG PF-3512676/7909. We are thankful to Drs. I. Luescher and P. Guillaume for synthesis of multimers, and M. Bruyninx, N. Montandon, and M. van Overloop for excellent technical and secretarial help. We thank our colleagues for continuous interest and insightful discussions. ↵2 D.E.S. and N.R. contributed equally to this work. ↵4 Abbreviations used in this paper: IFA, Incomplete Freund’s Adjuvant; EM, effector-memory. ↵5 The online version of this article contains supplementary material. Gourley, T. S., E. J. Wherry, D. Masopust, R. Ahmed. 2004. Generation and maintenance of immunological memory. Semin. Immunol. 16: 323-333. Blattman, J. N., R. Antia, D. J. Sourdive, X. Wang, S. M. Kaech, K. Murali-Krishna, J. D. Altman, R. Ahmed. 2002. Estimating the precursor frequency of naive antigen-specific CD8 T cells. J. Exp. Med. 195: 657-664. Yee, C., P. A. Savage, P. P. Lee, M. M. Davis, P. D. Greenberg. 1999. Isolation of high avidity melanoma-reactive CTL from heterogeneous populations using peptide-MHC tetramers. J. Immunol. 162: 2227-2234. Zeh, H. J., 3rd, D. Perry-Lalley, M. E. Dudley, S. A. Rosenberg, J. C. Yang. 1999. High avidity CTLs for two self-antigens demonstrate superior in vitro and in vivo antitumor efficacy. J. Immunol. 162: 989-994. Pass, H. A., S. L. Schwarz, J. R. Wunderlich, S. A. Rosenberg. 1998. Immunization of patients with melanoma peptide vaccines: immunologic assessment using the ELISPOT assay. Cancer J. Sci. Am. 4: 316-323. Clay, T. M., M. C. Custer, M. D. McKee, M. Parkhurst, P. F. Robbins, K. Kerstann, J. Wunderlich, S. A. Rosenberg, M. I. Nishimura. 1999. Changes in the fine specificity of gp100(209–217)-reactive T cells in patients following vaccination with a peptide modified at an HLA-A2.1 anchor residue. J. Immunol. 162: 1749-1755. Dutoit, V., V. Rubio-Godoy, M. J. Pittet, A. Zippelius, P. Y. Dietrich, F. A. Legal, P. Guillaume, P. Romero, J. C. Cerottini, R. A. Houghten, et al 2002. Degeneracy of antigen recognition as the molecular basis for the high frequency of naive A2/Melan-a peptide multimer+ CD8+ T cells in humans. J. Exp. Med. 196: 207-216. Rubio, V., T. B. Stuge, N. Singh, M. R. Betts, J. S. Weber, M. Roederer, P. P. Lee. 2003. Ex vivo identification, isolation and analysis of tumor-cytolytic T cells. Nat. Med. 9: 1377-1382. Rosenberg, S. A., J. C. Yang, N. P. Restifo. 2004. Cancer immunotherapy: moving beyond current vaccines. Nat. Med. 10: 909-915. Parkhurst, M. R., M. L. Salgaller, S. Southwood, P. F. Robbins, A. Sette, S. A. Rosenberg, Y. Kawakami. 1996. Improved induction of melanoma-reactive CTL with peptides from the melanoma antigen gp100 modified at HLA-A*0201-binding residues. J. Immunol. 157: 2539-2548. Yu, Z., M. R. Theoret, C. E. Touloukian, D. R. Surman, S. C. Garman, L. Feigenbaum, T. K. Baxter, B. M. Baker, N. P. Restifo. 2004. Poor immunogenicity of a self/tumor antigen derives from peptide-MHC-I instability and is independent of tolerance. J. Clin. Invest. 114: 551-559. Valmori, D., J. F. Fonteneau, C. M. Lizana, N. Gervois, D. Lienard, D. Rimoldi, V. Jongeneel, F. Jotereau, J. C. Cerottini, P. Romero. 1998. Enhanced generation of specific tumor-reactive CTL in vitro by selected Melan-A/MART-1 immunodominant peptide analogues. J. Immunol. 160: 1750-1758. Rivoltini, L., P. Squarcina, D. J. Loftus, C. Castelli, P. Tarsini, A. Mazzocchi, F. Rini, V. Viggiano, F. Belli, G. Parmiani. 1999. A superagonist variant of peptide MART1/Melan A27–35 elicits anti-melanoma CD8+ T cells with enhanced functional characteristics: implication for more effective immunotherapy. Cancer Res. 59: 301-306. Ayyoub, M., A. Zippelius, M. J. Pittet, D. Rimoldi, D. Valmori, J. C. Cerottini, P. Romero, F. Lejeune, D. Lienard, D. E. Speiser. 2003. Activation of human melanoma reactive CD8+ T cells by vaccination with an immunogenic peptide analog derived from Melan-A/melanoma antigen recognized by T cells-1. Clin. Cancer Res. 9: 669-677. Speiser, D. E., D. Lienard, N. Rufer, V. Rubio-Godoy, D. Rimoldi, F. Lejeune, A. M. Krieg, J. C. Cerottini, P. Romero. 2005. Rapid and strong human CD8+ T cell responses to vaccination with peptide: IFA, and CpG oligodeoxynucleotide 7909. J. Clin. Invest. 115: 739-746. Speiser, D. E., P. Baumgaertner, V. Voelter, E. Devevre, C. Barbey, N. Rufer, P. Romero. 2008. Unmodified self antigen triggers human CD8 T cells with stronger tumor reactivity than altered antigen. Proc. Natl. Acad. Sci. USA 105: 3849-3854. Boon, T., P. G. Coulie, B. J. Van den Eynde, P. van der Bruggen. 2006. Human T cell responses against melanoma. Annu. Rev. Immunol. 24: 175-208. Speiser, D. E., P. Baumgaertner, C. Barbey, V. Rubio-Godoy, A. Moulin, P. Corthesy, E. Devevre, P. Y. Dietrich, D. Rimoldi, D. Lienard, et al 2006. A novel approach to characterize clonality and differentiation of human melanoma-specific T cell responses: spontaneous priming and efficient boosting by vaccination. J. Immunol. 177: 1338-1348. Pittet, M. J., D. Valmori, P. R. Dunbar, D. E. Speiser, D. Lienard, F. Lejeune, K. Fleischhauer, V. Cerundolo, J. C. Cerottini, P. Romero. 1999. High frequencies of naive Melan-A/MART-1-specific CD8+ T cells in a large proportion of human histocompatibility leukocyte antigen (HLA)-A2 individuals. J. Exp. Med. 190: 705-715. Romero, P., A. Zippelius, I. Kurth, M. J. Pittet, C. Touvrey, E. M. Iancu, P. Corthesy, E. Devevre, D. E. Speiser, N. Rufer. 2007. Four functionally distinct populations of human effector-memory CD8+ T lymphocytes. J. Immunol. 178: 4112-4119. Rufer, N., P. Reichenbach, P. Romero. 2005. Methods for the ex vivo characterization of human CD8+ T subsets based on gene expression and replicative history analysis. Methods Mol. Med. 109: 265-284. Roux, E., C. Helg, F. Dumont-Girard, B. Chapuis, M. Jeannet, E. Roosnek. 1996. Analysis of T-cell repopulation after allogeneic bone marrow transplantation: significant differences between recipients of T-cell depleted and unmanipulated grafts. Blood 87: 3984-3992. Derre, L., M. Bruyninx, P. Baumgaertner, E. Devevre, P. Corthesy, C. Touvrey, Y. D. Mahnke, H. Pircher, V. Voelter, P. Romero, et al 2007. In vivo persistence of codominant human CD8+ T cell clonotypes is not limited by replicative senescence or functional alteration. J. Immunol. 179: 2368-2379. Lefranc, M. P., V. Giudicelli, C. Ginestoux, J. Bodmer, W. Muller, R. Bontrop, M. Lemaitre, A. Malik, V. Barbie, D. Chaume. 1999. IMGT, the international ImMunoGeneTics database. Nucleic Acids Res. 27: 209-212. Arden, B., S. P. Clark, D. Kabelitz, T. W. Mak. 1995. Human T-cell receptor variable gene segment families. Immunogenetics 42: 455-500. Crooks, G. E., G. Hon, J. M. Chandonia, S. E. Brenner. 2004. WebLogo: a sequence logo generator. Genome Res. 14: 1188-1190. Yousfi Monod, M., V. Giudicelli, D. Chaume, M. P. Lefranc. 2004. IMGT/JunctionAnalysis: the first tool for the analysis of the immunoglobulin and T cell receptor complex V-J and V-D-J JUNCTIONs. Bioinformatics 20 Suppl. 1: i379-i385. Romero, P., V. Dutoit, V. Rubio-Godoy, D. Lienard, D. Speiser, P. Guillaume, K. Servis, D. Rimoldi, J. C. Cerottini, D. Valmori. 2001. CD8+ T-cell response to NY-ESO-1: relative antigenicity and in vitro immunogenicity of natural and analogue sequences. Clin. Cancer Res. 7: 766s-772s. Trautmann, L., N. Labarriere, F. Jotereau, V. Karanikas, N. Gervois, T. Connerotte, P. Coulie, M. Bonneville. 2002. Dominant TCR V α usage by virus and tumor-reactive T cells with wide affinity ranges for their specific antigens. Eur. J. Immunol. 32: 3181-3190. Dietrich, P. Y., F. A. Le Gal, V. Dutoit, M. J. Pittet, L. Trautman, A. Zippelius, I. Cognet, V. Widmer, P. R. Walker, O. Michielin, et al 2003. Prevalent role of TCR α-chain in the selection of the preimmune repertoire specific for a human tumor-associated self-antigen. J. Immunol. 170: 5103-5109. Genevee, C., A. Diu, J. Nierat, A. Caignard, P. Y. Dietrich, L. Ferradini, S. Roman-Roman, F. Triebel, T. Hercend. 1992. An experimentally validated panel of subfamily-specific oligonucleotide primers (V α 1-w29/V β 1-w24) for the study of human T cell receptor variable V gene segment usage by polymerase chain reaction. Eur. J. Immunol. 22: 1261-1269. Cole, D. K., F. Yuan, P. J. Rizkallah, J. J. Miles, E. Gostick, D. A. Price, G. F. Gao, B. K. Jakobsen, and A. K. Sewell. 2009. Germline-governed recognition of a cancer epitope by an immunodominant human T-cell receptor. J. Biol. Chem. [Epub ahead of print] 2009 Jul 15. Garboczi, D. N., P. Ghosh, U. Utz, Q. R. Fan, W. E. Biddison, D. C. Wiley. 1996. Structure of the complex between human T-cell receptor, viral peptide and HLA-A2. Nature 384: 134-141. Derre, L., M. Bruyninx, P. Baumgaertner, M. Ferber, D. Schmid, A. Leimgruber, V. Zoete, P. Romero, O. Michielin, D. E. Speiser, N. Rufer. 2008. Distinct sets of αβ TCRs confer similar recognition of tumor antigen NY-ESO-1157–165 by interacting with its central Met/Trp residues. Proc. Natl. Acad. Sci. USA 105: 15010-15015. Barbey, C., P. Baumgaertner, E. Devevre, V. Rubio-Godoy, L. Derre, G. Bricard, P. Guillaume, I. F. Luescher, D. Lienard, J. C. Cerottini, et al 2007. IL-12 controls cytotoxicity of a novel subset of self-antigen-specific human CD28+ cytolytic T cells. J. Immunol. 178: 3566-3574. Moss, P. A., R. J. Moots, W. M. Rosenberg, S. J. Rowland-Jones, H. C. Bodmer, A. J. McMichael, J. I. Bell. 1991. Extensive conservation of α and β chains of the human T-cell antigen receptor recognizing HLA-A2 and influenza A matrix peptide. Proc. Natl. Acad. Sci. USA 88: 8987-8990. Lehner, P. J., E. C. Wang, P. A. Moss, S. Williams, K. Platt, S. M. Friedman, J. I. Bell, L. K. Borysiewicz. 1995. Human HLA-A0201-restricted cytotoxic T lymphocyte recognition of influenza A is dominated by T cells bearing the V β 17 gene segment. J. Exp. Med. 181: 79-91. Argaet, V. P., C. W. Schmidt, S. R. Burrows, S. L. Silins, M. G. Kurilla, D. L. Doolan, A. Suhrbier, D. J. Moss, E. Kieff, T. B. Sculley, I. S. Misko. 1994. Dominant selection of an invariant T cell antigen receptor in response to persistent infection by Epstein-Barr virus. J. Exp. Med. 180: 2335-2340. Gillespie, G. M., G. Stewart-Jones, J. Rengasamy, T. Beattie, J. J. Bwayo, F. A. Plummer, R. Kaul, A. J. McMichael, P. Easterbrook, T. Dong, et al 2006. Strong TCR conservation and altered T cell cross-reactivity characterize a B*57-restricted immune response in HIV-1 infection. J. Immunol. 177: 3893-3902. Borbulevych, O. Y., F. K. Insaidoo, T. K. Baxter, D. J. Powell, Jr, L. A. Johnson, N. P. Restifo, B. M. Baker. 2007. Structures of MART-126/27–35 peptide/HLA-A2 complexes reveal a remarkable disconnect between antigen structural homology and T cell recognition. J. Mol. Biol. 372: 1123-1136. Price, D. A., T. E. Asher, N. A. Wilson, M. C. Nason, J. M. Brenchley, I. S. Metzler, V. Venturi, E. Gostick, P. K. Chattopadhyay, M. Roederer, et al 2009. Public clonotype usage identifies protective Gag-specific CD8+ T cell responses in SIV infection. J. Exp. Med. 206: 923-936. Trautmann, L., M. Rimbert, K. Echasserieau, X. Saulquin, B. Neveu, J. Dechanet, V. Cerundolo, M. Bonneville. 2005. Selection of T cell clones expressing high-affinity public TCRs within human cytomegalovirus-specific CD8 T cell responses. J. Immunol. 175: 6123-6132. Price, D. A., J. M. Brenchley, L. E. Ruff, M. R. Betts, B. J. Hill, M. Roederer, R. A. Koup, S. A. Migueles, E. Gostick, L. Wooldridge, et al 2005. Avidity for antigen shapes clonal dominance in CD8+ T cell populations specific for persistent DNA viruses. J. Exp. Med. 202: 1349-1361. Gras, S., X. Saulquin, J. B. Reiser, E. Debeaupuis, K. Echasserieau, A. Kissenpfennig, F. Legoux, A. Chouquet, M. Le Gorrec, P. Machillot, et al 2009. Structural bases for the affinity-driven selection of a public TCR against a dominant human cytomegalovirus epitope. J. Immunol. 183: 430-437. Kjer-Nielsen, L., C. S. Clements, A. W. Purcell, A. G. Brooks, J. C. Whisstock, S. R. Burrows, J. McCluskey, J. Rossjohn. 2003. A structural basis for the selection of dominant αβ T cell receptors in antiviral immunity. Immunity 18: 53-64. Stewart-Jones, G. B., A. J. McMichael, J. I. Bell, D. I. Stuart, E. Y. Jones. 2003. A structural basis for immunodominant human T cell receptor recognition. Nat. Immunol. 4: 657-663. Gallimore, A., T. Dumrese, H. Hengartner, R. M. Zinkernagel, H. G. Rammensee. 1998. Protective immunity does not correlate with the hierarchy of virus-specific cytotoxic T cell responses to naturally processed peptides. J. Exp. Med. 187: 1647-1657. Speiser, D. E., D. Kyburz, U. Stubi, H. Hengartner, R. M. Zinkernagel. 1992. Discrepancy between in vitro measurable and in vivo virus neutralizing cytotoxic T cell reactivities: low T cell receptor specificity and avidity sufficient for in vitro proliferation or cytotoxicity to peptide-coated target cells but not for in vivo protection. J. Immunol. 149: 972-980.